Director Tharanga Ramanayake wants you to get involved in the MAYOR ROB FORD: THE DOCUMENTARY - and it's all for a good cause. Tharanga has been asking Rob Ford for an interview since the ice age. 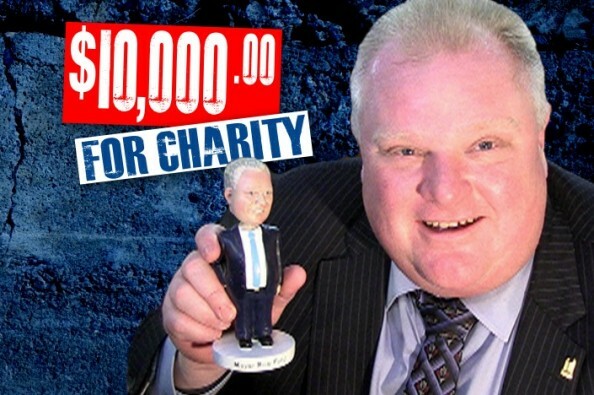 The Mayor doesn't have much time to speak to indi-filmmakers, but luckly Mr. Ford makes time for charity. So Tharanga is raising TEN THOUSAND DOLLARS for the Toronto Humane Society in exchange for a one-on-one interview. Contributors have the chance to place their content in the documentary and ask questions from the Mayor. The money goes to charity. In the event Rob Ford doesn't give an interview, or Tharanga doesn't reach his funding goal the money will be given back to the contributors. Tharanga Ramanayake is a Film + TV Creative in Toronto. A former producer at Citytv and CP24, his skills has earned him a Gemini Award, 13 Promax Awards and believe it or not, even a Guinness World Record (World's Shortest TV commercial). Notable projects include: FashionTelevision, Canada's Worst Driver & Theatrical Trailers for blockbusters such as: The Lord Of The Rings, The King's Speech, Drive, The Fighter, Inglourious Basterds, Looper and many more. Check out www.tharanga.ca for his work. See your name in the credits of the movie. Got a question for the Mayor? Send by video or email. Signed by both Rob and Doug, original Bobblehead. Good luck. I'm glad to contribute to a great creative project. Helping a fellow Sri Lanakan.